Visual: Pale hazy lemon juice. Thin off white head a few seconds in after an initially large head on the pour. Nose: Fresh squeezed lemon with the leftover lemon rind in it. Cake sponge. Pineapple. Lime touch. Body: Tart and fresh. Vanilla. Slightly peppery. Lemon juice. Creamy lemon. Sherbety feel. Orange slices. Mild peppercorn. Slightly dry. Finish: Creamy lemon and vanilla. NY style cheesecake. Fresh orange slices. Salted lemons. Mild peppercorn sauce. Conclusion: I swear that I didn’t look at the back of bottle before specifying in the notes above that it was NY style cheesecake that this seemed like. It just turns out that my impressions and how they describe it were identical for once – that slightly drier bodied cheesecake style. Good shout from them then. Despite that, the cheesecake side of this is actually lighter than I expected. This has a drier take on a wit that seems to call to the pre inbev Hoegaarden (Well – I say that – my only experience is of the Celis white which was made by the original brewer, and is apparently very close to the original Hoegaarden, so my comparison is at least a few stages separated from the original). It comes in with lots of tart lemon notes that feel very natural fruit in character. There are some creamier edges as the vanilla mixes in, giving slightly fuller feel on the way out, but main body definitely emphasises the dry and fresh character. What I did not expect from the bottle’s description though is the peppery character – coming in from standard pepper into subtle peppercorn sauce in flavour – adding that traditional wit spice behind the more creamy lemon notes. So, looking at this as a cheesecake beer, well it does have influence from that idea, and it definitely shows the vanilla and lemon it uses, but they come more as discrete elements that a coherent cheesecake whole for the most part. As a beer in itself thought it does it right. Initially it seems only ok, but it develops into a traditional dry wit backed by creamier, fuller edges, and subtle solid backing behind the lemon freshness that is easy to drink while still being rewarding. It is better to be a good beer that doesn’t quite deliver on the concept that a good concept that doesn’t deliver on the beer, so I am happy with this one. Background: I’m not sure if that is the longest beer name I have ever had on this site – but it is at least in the top 5. So, a Belgian wit made with lemon and vanilla – a simpler beer than the cool name makes it sound, but still the idea sold me pretty much instantly. Another one grabbed from Independent Spirit. I make no apologies for grabbing so much from them. Drunk while listening to the 50th spektrmodule podcast for some gentle background music. Visual: Cloudy lemon juice. Thin white head – mainly sud bubbles. Low carbonation. Nose: Lemon. Pineapple juice. Coriander. Wheat. Dry. Meringue. Body: Dry. Lemon juice and lemon curd. Cinnamon. Coriander. Carrot. Traditional lemonade. Light greenery. Palma violets. Slight cardboard. Finish: Carrot. Dry. Wheat. Greenery. Cardboard. Palma violets. Menthol. Lime. Orange zest. Conclusion: This seems very dry for a wit – feels quite highly attenuated, which is a mixed blessing here. It leans the beer away from the overly sweet popular interpretation and gives a good platform for fresh lemon flavour to come through. That element, combined with the dry base, makes for a pleasant mouth refresher in the mid body. It also lets the spice work delicately, it can be a rounding note rather than having to be pushed up to fight with a sweet base – coriander and carrot on the savoury side, and cinnamon dusted doughnuts on the slightly sweeter edges. So with that said, what is working against it? Well the dryness also has characteristics similar to an over attenuated America Pale Ale – it gets slightly harsh near the end of the body and brings out an unpleasant cardboard like element in the finish. It is that finish that really hurts it – while the dryness can introduce weaker elements in the rest of the beer, they are usually contrasted by very well done elements. In the finish there is little redeeming to contrast the flaws. A pity, as shown by the first paragraph there is a lot of good in this beer but the finish just stomps on it. So, it has promise, but really needs to work on the dryness balance as it really lets itself down in overtime (AKA the finish). I would recommend they keep trying though, as this feels like if the brewers keep pushing at it, it could be fine tuned to something very nice. 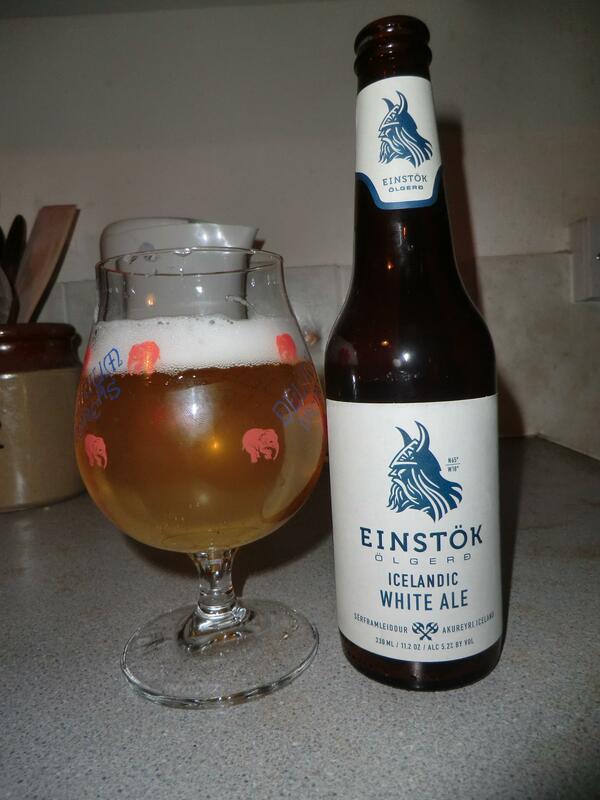 Background: OK, I grabbed this one because it is from Norway – we don’t see many of their beers over here, and they tend to be fairly solid. I went for their Wit as you don’t see that many of them comparatively, and it is a solid beer style, done here without and fancy craft twists. Felt it would be a good way to get a handle on the brewery. I was surprised by the can – the ring pull takes the entire top of the can off, more like a soup can kind of ring pulls. Drunk while listening to a mix made up of my most listened to tracks, so definitely ones I would enjoy for this beer session :-). This was grabbed from Independent Spirit of Bath. Visual: Pale hazy lemon juice. Massive loose fragile white bubbled head. Nose: Crisp. Light kiwi. Slightly soured. Wheat and lightly earthy. Lemon juice. Coriander. Body: Lightly tart. Shredded wheat. Moderate bitterness. Light kiwi. Tart lime. spirtzy feel like a touch of white wine. Finish: Squeezed lemon and lime. Shredded wheat. Sour dough. Kiwi. Solid bitterness. Dried passion fruit. White wine dryness. Conclusion: Would this beer work better if the base beer was more rounded before you started adding the extra ingredients in? Hard to say, but it does feel like the underlying wit has been either neglected, or hidden by the fruit. The base beer isn’t bad, but it doesn’t seem to have anywhere near the character a top end wit should have. It has a solid, if somewhat leaden hopped bitterness, and a slightly cloying sourness, but the usual tart character and spice is very muted and lacking from the beer. The fruit does add a bit to help offset that. While muted the fruit is there, especially creating a kiwi kind of note in the interactions, and it is this that gives most of the flavour where the base is lacking. By doing this it does become a passable wit, refreshing due to the sour, slightly cloyed nature, and the flavour comes from the fruit backing. It is evident though that the quirk is basically propping up the wit though. So, it comes in as drinkable, in fact that is the most impressive quality. It is very easy to drink, but not especially impressive. Still at least it avoids going the over sweet route that a lot of shoddy wit’s go for. An ok beer , but not much above that. Background: This is how easy I am to sell to. I see a bottle with no label on the front. I look at it, I see it only has the (pictured) label on the back. I buy it. I have no willpower. So, a wit made with Passion fruit and key lime, part of Omnipollo’s “Magic Numbers” small batch series. This is my first experience with Omnipollo, so I’m hoping they will be good. Picked up from Independent Spirit, which is probably a surprise to no one by now. Visual: Cloudy lemon juice. Medium white bubbled head. Nose: Wheaty. Lemon and grapefruit juice. Dry spices, with a pepper touch. Funky yeast. Milk. Acidic apple. Body: Lemon curd and meringue. Sparkling feel and fizzy. Elderberry and sour grapes. Grapefruit. White wine. Turmeric. Finish: Elderberry. Dry finish. Muesli. Sour white grapes. Wet oak. Conclusion: I remember trying this one many a year ago and not being much of a fan of it. Odd how time changes things. 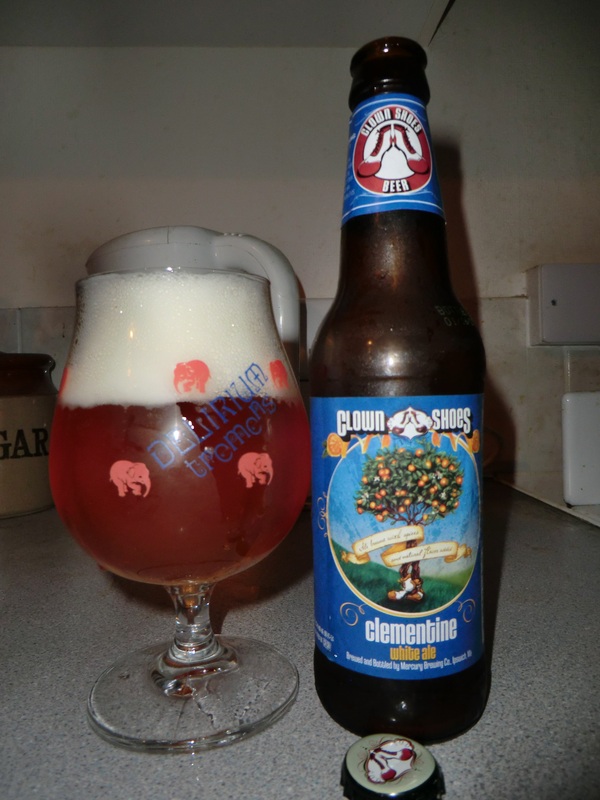 This is a very drying wit beer, much more so than most takes I have encountered – there is a lot of tart, refreshing, fruit notes, but sharply done so they head out leaving you drier than when they came in. The beer’s obsession with grapefruit and sour grape notes make me think of NZ hops, though I doubt they were used here, probably a case of parallel evolution and all that. Despite being so drying it does make for a very refreshing wit, it is the sparkling, sometime slightly over fizzy character – it dries but leaves that sheen in the mouth that makes it feel awoken. Oddly for a wit the beer doesn’t seem to reply on the spices too much – they are there, creating a grounded dry effect, but they aren’t a huge part of it. It makes for an almost grapefruit wit, and as of such it is something I appreciate for its mentioned refreshing character. It is still more a beer I appreciate than adore, for all I have come to enjoy it more over the years. It could be the dryness, dry beers have to work a bit harder for my affection – but it is very interesting, both as a call to the less sweet, traditional, wit and as progression in the style of its own. 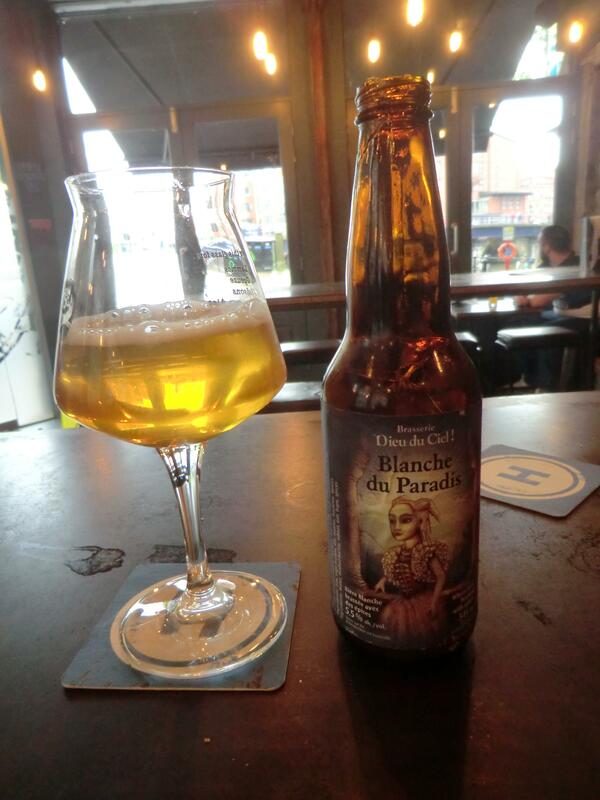 As such, it is still not a favourite beer , but it is worth checking out. Most of my disagreements with it are matters of personal preference, and I’m sure there are a lot of people that this would work perfectly for. Background: St Bernardus are pretty awesome in general, as mentioned in the review I have tried this before and wasn’t too big a fan, but decided to give it another go. I picked this up from The Beer Emporium which has very nice bottle selection and is a great bar as well. That’s about it at the moment. Visual: Rose wine coloured, low carbonation. Clear white half inch of tight bubbles for a head. Leaves sud rings. Nose: Perfume. Light wheat and bitterness. Body: Bitter. Sesame seeds. Perfume. Musty. Sour dough. Wheat. Light sweetness at back. Barley. Some very subtle strawberry and vanilla after drinking for a while. Finish: perfume. Somewhat musty. Dry. seeds. Conclusion: The new Hibiscus Wit, is it much different from the old Juniper Wit? Unfortunately no, it is pretty much in the same ballpark quality wise. It smells and tastes quite perfumed (that is the taste you can get in your mouth when smelling perfume, not when you drink a bottle) mixed in with a certain sour dough element. There is a taste like chewing on rose petals that lasts far too long into the finish. There is a wit base, but it is very hard to tell from the flavours you get, it is nigh unrecognisable as that style. It is too cloying to be refreshing, and the flavours set in too long to be sessionable, the taste range is small and unappealing. There is a light barley sweetness, which is about the only element I don’t dislike in this. I wasn’t a fan of Juniper Wheat, and this really hasn’t changed enough from that to appeal to me at all (Now I will probably find out the recipes are completely different or something – my point on the unimpressive flavour still stands). I am actually surprised that this went from being a small keg tester release to being actually bottled. So no, not impressed with this one at all. 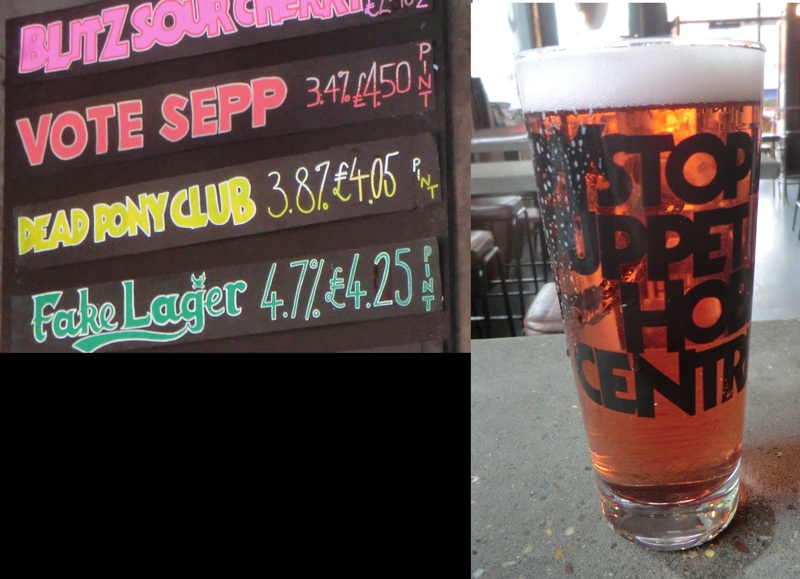 Background: So, Brewdog are poking fun at the blatant corruption of FIFA. Good. I mean I’m hardly a footy fan, but seriously, FIFA are so obvious Captain Planet level early morning cartoonishly corrupt it takes the piss. Speaking of FIFA and taking the piss, check out John Oliver on FIFA, it is one of the funniest things I have seen in a long time. Anyway this is a hibiscus wit beer, originally it was going to be called “Hibiscus Wit” (Shockingly) and be keg only, but a quick FIFA piss take later it is now also out in bottles. As always I am not an unbiased actor on Brewdog beers. Note: The rose colour doesn’t seem to have come across in the photo, I swear that is what it looked like in the bar! Visual: Yellowed grain with very large suded mounds of froth for a head. Quite hazy main body. Nose: Wheat and pepper. Lemon fresh jiff. Light bitterness. Turmeric earthy hints. Body: Bitter and wheaty. Tangerine juice. Mild gingerbread. Prickly and peppery. Robust up front, thinner at the end. Mild malt toffee middle. Finish: Light bitterness. Digestives. Light zest and orange. Pepper. Lemon curd. Light peppermint. Conclusion: Clown Shoes, take 2. Here they are using a very traditional wit base, but with a bit of a twist in the effects of the flavouring and spice. I say effects as the ingredients are pretty standard, coriander and orange peel, using either of these is not unusual in any way. However here the orange feels fuller and sweeter than most, while the spice feels more pepper like and dry. In many ways it inverts my expectations of slightly tarter fruit and more grounded spice. The wheaty base layers the bitterness on a bit heavier than normal, and more notably the bitterness is more hoppy in style as well. What does this create? Well a more up front beer. The Belgian takes can go from overly sweet in some of the more mainstream efforts, to quite dry and subtle in some of the more traditional. This is more up front without being pandering, but still has some of the subtle lemon notes of the traditional take. How well does it work? Well it is pleasing, the hop bitterness and pepper give a rough edge that works well with the wheat, and the orange is a good contrast. It has a limited range of flavours, but lines them up so they work reasonably well off each other. It doesn’t seem to be trying for challenging like Blanche du Paradis. or booming like not just another wit. It is instead an everyday enjoyable wit that mixes American hop obsession with Belgian wit subtlety and in that it makes for a good summer filled yet bitter beer. Now a showstopper, but pleasant and brightens a day while still having some edge. Background: Made with orange peel and coriander, which is pretty standard for wit beers. This was picked up from Brewdog’s guest beer selection. I was trying for an impressive head on the pour of the is, and went a bit overboard, resulting in having to rapidly sip the rising froth to stop it overflowing. Not much else to add on this one. Visual: Pale yellow. Moderate off white bubbles and low carbonation. Nose: Thick and musky fruit. Pineapple and passion fruit. Cloves. Cream. Lemon cordial. Pepper. Body: Sprityz. Fresh lemon. Meringue. Cream. Sweet lime jelly. Lemon curd. Cinnamon. Toffee. Orange. Finish: White grapes. Meringue. Cream. Cinnamon. Dry lemon. Wheaty. Passion fruit. Vanilla. Bubblegum. Conclusion: This would probably have been more highly rated if it had not come hot on the heels of its Canadian competition. It really did have bad timing to be entering my tasting notes list. By itself it is a pleasant, sweeter edged take on the wit style, though with a satisfying dryness behind it which tempts it back from being compared to the more commercial and over sweet wits. It has slightly unusual notes such as toffee in amongst the lemon, and a pungent fruit thickness in the aroma that hints as some good experimentation with the style. Also odd is that the beer is nowhere near as spiced as many examples of the style, they are not completely absent, but the beer does seem to be focusing elsewhere for its most prominent elements. Where it is most traditional is the finish, drying and with that Belgian yeastiness given full effect. It’s a nice touch that allow the slight oddities of the body to coexist with the style expectations. Its main problem is that it came after Dieu Du Ciel awesomeness, and in comparison it seems very mainstream despite its quirks. It really isn’t though, yes it is sweet like a lot of mainstream wits, but it uses that full funky yeast character and pushes its own way with its different interpretations. Not bad, but not up there with the greats. Background: Beer from Iceland! Ok, I’ll admit that was mainly why I picked it up. I’m allowed my quirks. Anyway, picked this up from Independent Spirit, I’ve seen their bottles around a bit in craft beer pubs recently, but never got around to giving it a try. Anyway, not much to say on this one, so few preconceptions going in. Visual: Light grain to yellow. Yellow white head. Nose: Funky Belgian yeast. Slightly tart. Lemon. Coriander. Banana sweets. Body: Big amounts of banana and yeast. Cream. Apricot. Lemon curd. Meringue. Coriander. Banana milkshake. Finish: Carrot and coriander. Funky yeast, Dry. Milk. Meringue and lemon curd. Banoffee milkshake. Wheaty hop character. Conclusion: Throw away your hoegaardens boys and girls, this is full on wit with no compromises. Lots of that funky yeast character and lots of fruity esters with it. In fact the normally prominent spices are very light behind it, merely giving enough for a tingle to work in the place of other beers hop characters. Despite the full on yeasty style, the finish is actually delicate enough to nigh instantly invite further sipping in a session style. There is no lasting harshness or anything to put you off continuing the beer. Though don’t be mistaken, if you do manage to hang on and not take the next sip then the light banana, lemon curd and meringue elements that hang around are far from boring, and definitely last. There is almost a banoffee milkshake character to the backbone of the beer (and please don’t tell me if there is, in fact, no such thing as banoffee milkshake, let me have my dreams), it is again a low element behind the massive funky yestiness , so never gets sickly, but is a delicious note to back up the main character. For criticisms, well I would put Mikkellers “Not Just Another Wit” ahead of it for sheer enormity of flavour, however that is a much heavier beer, so they are barely even in the same style for comparisons. One is a beer to relax and take your time with, while this is just slightly too strong to be a perfect session beer. So frankly an awesome, nearly sessionable, Belgian wit and far from the over sweet and watered down mainstream efforts you too often find. Lovely flavour, lovely feel and perfect use of yeast. Spot on. Background: Canadian craft beer! Woo! I’ve been keeping an eye on PEI Beer Guy’s blog for a while, and bemoaned my inability to find some of the tasty sounding beers over here. 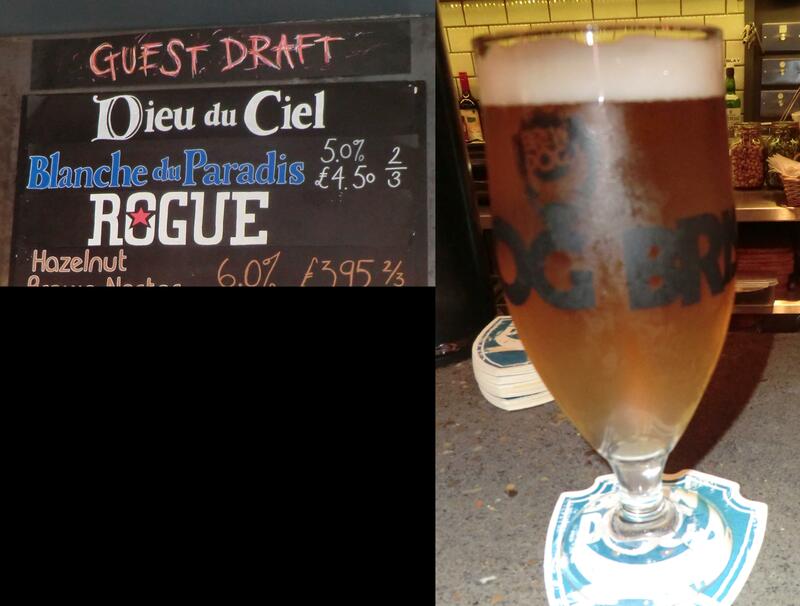 Then I found this on tap at Brewdog Bristol. So I drank it. 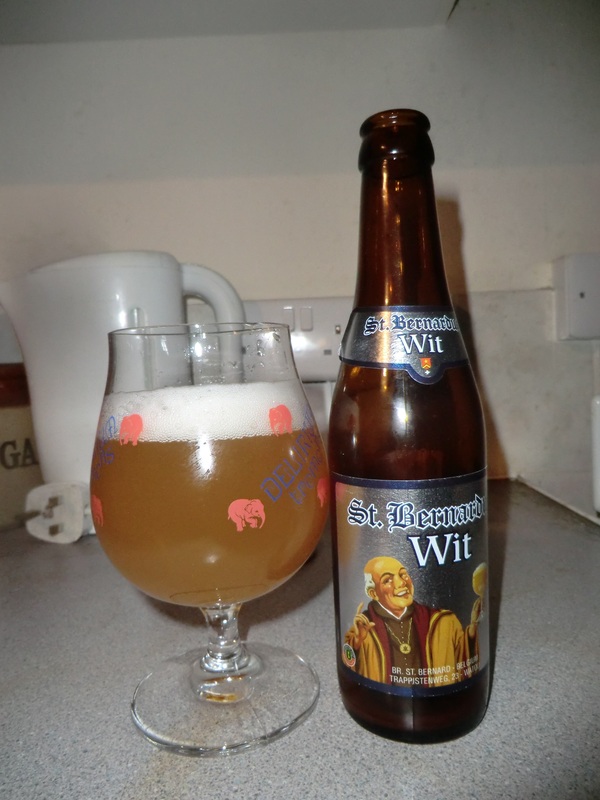 I had been told beforehand that this was very much an old style Belgium wit so was very much looking forward to it.